The next three days could bring possible record setting heat to the D.C. area with highs near 90 degrees. It will also bring poor air quality to the area. An air quality alert is in effect Wednesday. Here's what you need to know. 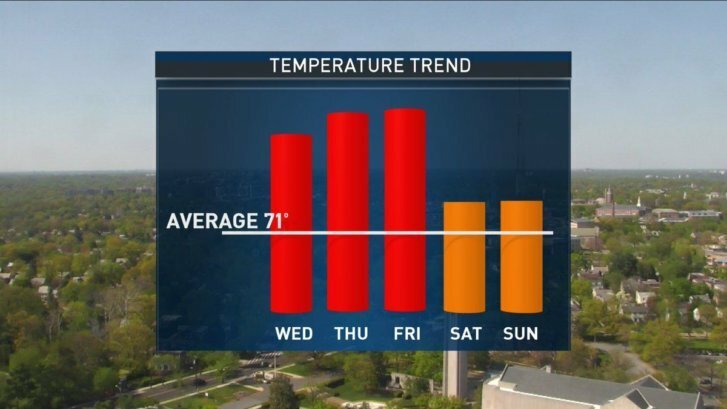 WASHINGTON — If you haven’t already, get out your sunscreen and sunglasses as the “warming trend” this week carries on. Each day will only get hotter and hotter. The afternoon highs could set a new record on Wednesday, Thursday and Friday. The temperature is expected to get up to 88 degrees Wednesday, 90 on Thursday and close to 91 on Friday, outshining the average high temperatures of 71 degrees for this time of year. “After a cool and rainy April, May is off to a sizzling start,” said Storm Team 4 meteorologist Chuck Bell. Bell said the record for May 2 is 89 degrees at Reagan National Airport, 88 at Dulles International Airport and 88 degrees at BWI Marshall Airport. While the sunshine and warmth is a welcome change for some, one air quality expert warns that others may want to limit their physical activity outside. An air quality alert is in effect Wednesday, which may pose health risks for people with respiratory or heart conditions and especially children with asthma, said Stephen Walz, director of the Department of Environmental Programs at the Metropolitan Washington Council of Governments. Walz said the D.C. region should also expect a Code Orange day Thursday. “it’s best to just stay inside in the later part of the day,” Walz said about the groups of people that may be sensitive to the code orange forecast. The general public is not likely to be affected. The combination of hot weather, sunshine and buildup of some of the causes of air pollution are to blame for the potentially harmful air. Walz said people can prevent the exacerbation of the ozone’s conditions by limiting the use of electricity and anything gas-powered. The ozone season starts April 1 and continues into the fall, Walz said. People in at-risk groups that may experience health issues with an unhealthy air quality may want to be careful. People can sign up to receive ozone alerts when the air quality is poor through Clean Air Partners.